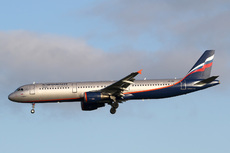 Aeroflot flight SU2597 suffered an airprox incident with two AMX aircraft near Treviso. The aircraft, an Airbus A321, took off from runway 04R at Venice-Marco Polo Airport at 11:02 UTC. The flight was cleared for the ROSKA6X Standard Instrument Departure (SID), which called for a right hand turn (heading 131°) after departure. Because of substantial storm formations in the south, the Venice Tower controller allowed the flight to continue on runway heading. The flight was instructed to contact the Venice APP controller. Standard Instrument Departure. The line was busy and by the time contact was made, the Aeroflot flight had already radioed Venice APP that they were climbing to 4000 feet. The flight was initially cleared to climb to FL90 but the controller at 11:03:58 instructed SU2597 to stop the climb at 4000 feet because of other unkown traffic. The aircraft then entered the Treviso CTR, causing a conflict with two AMX jets of the Italian Air Force. The AMX jets had just performed a go around after a low pass over runway 07 at Treviso Air Base. They were climbing to 4000 feet to postition for a GCA approach to runway 26 at Istrana Air Base. They were under control of Treviso Approach Control. The Treviso APP controller tried get the ATC planner to contact Venice APP by phone to enquire about the oncoming traffic. But the planner was busy making another call. Treviso APP then instructed the AMX jets to turn left to avoid a conflict with the Airbus. At the same time Venice APP attempted to call the Treviso planner, but the line was busy. Venice APP then instructed the Airbus to turn right. Having received a TCAS Resolution Advisory to climb, the A321 climbed towards 4000 feet, passing 0,5 NM (925 m) behind the AMX jets. The safety investigation has identified the origin of the event, a critical issue in terms of direct and immediate communications between Venice APP (managed by ENAV SpA) and Treviso APP (operated Air Force), which, given the construction of respective areas of competence, does not, in the case of unpredictable traffic mutual interference, to promptly and effectively handle the separations of air traffic. To the event also contributed, albeit marginally, an inertia in the decision-making reaction from both operational teams of the two air traffic control centers.